Week 36 Welcome back to a new season... and some changes. I've just checked back and see that this blog has been on the go since January 2012. At that time there was just a ragbag of dances on YouTube. I quote from my very first tentative blog posting "In advance, thank you to all the participants in the videos I'll link to for making them publically available. They are a wonderful resource." (Do go back and check it out... there is that cracking video of the Kandahar Reel!) I'm very glad to say, that others have had the same thought and we now have the Strathspey Server and the Scottish Country Dancing Dictionary doing a systematic and wonderful job with links to videos, music recordings, dance instructions etc.etc... I'm so pleased! Social media has also grown apace and moving with the times (don't we always?) we are going to move over to using Facebook so everybody can chip in. Week 23... and end-of-season dance with Hole in the Wall, Good Hearted Glasgow, Frimley Green Reel, Jean Martin of Aberdeen, Golden Pheasant, Autumn in Appin, Bees of Maggieknockater, Scottish Waltz, Inchmickery, Reel of the Puffins, Out of Thin Air, Dancing Master, Portnacraig, Yes-I do, Morrison's Measure and Pelorus Jack. Week 21 Lot of repeats this week as we practice for an upcoming demo and the Copenhagen weekend.... Dancing Dolphins, Wind on Loch Fyne, Jig for Althea, Sound of Harris, Border Weavers, Welcome to Dufftown, Out of Thin Air and Sleepy Maggie. STILL surprisingly no video of that last one... maybe after Copenhagen Capers? In fact, not many videos available of our demo dances either. Do we need an official photographer on board before this big bash next year??? Week 20 Trimming the sails this week for an upcoming demo: Sound of Harris, Border Weavers, Dancing Dolphins and Arctic Circle. Following the break we swung into action with 'The Kilted Norseman' followed by a couple of dances from another event some of our members will be attending this weekend in Skye: Napier's Index and Burnieboozle. I managed to find a video of that last one... and do compare it to Gothenburg's Welcome! Week 19 The very appropriate Frimley Green Reel as a starter this week at FUNdamentals, followed by more for Copenhagen... Lowland Lilt, Copenhagen Strathspey, Midnight Oil, The Highlandman Kissed his Mother, Lion Rampant, Brig o'Doon and Duke of Perth. Week 18 Six more from the Copenhagen Capers and some good videos this week: Glengarry Swing (It's the second dance in this "vídeo espectacular" of a whole evening of mixed level SCD edited down to 11 minutes), Neil Gow's Farewell to Whisky (Here is the hauntingly beautiful original tune... I really appreciate the background stuff! ), Welcome to Dufftown, Dream Catcher, The Bored Meeting (Oh.. to be original on the Internet! ), Out of Thin Air and Blacksmith of Elgin. Week 16 FUNdamentals this week, followed by The Suzuki Circle, Jig for Elthea, The Sailor, Pei Link, Clutha, The Twa Corbies, Wind on Loch Fyne and De'il Amang the Tailors. During the next few weeks I expect we will be doing some dances in preparation for the upcoming Copenhagen Capers weekend, which a number of our members will be at attending. Get the dance list here and do read about the activities of the International Branch of the RSCDS while you are in there. ... thanks for this, Leon! Week 13 Excellent dances this week too: It's time to..., Capelthwaite, Yes-I do, The Compleat Gardiner, The Mayor and her Secretary (great dances, music and videos, Martin... very sorry not to be with you guys next weekend), Montparnasse and Whigmaleeries. Continuing last week's theme, the music to which we danced Yes-i Do is an old favourite of mine,The Iona Cross, and blow me, two others of my all time favourites turned up this week too; Hanneke Cassel & Dave Weislers' Arthur Seat (Capelthwaite) and McGregor's Leap (The Mayor and her Secretary). 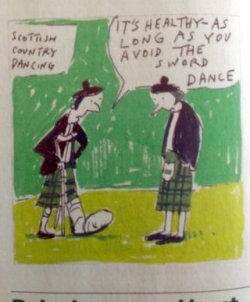 I'm no expert in these matters, but I do know that if there are more than one of either the Skye Barbeque, Bromley Brae or Glasgow Reel tunes in any one dance... I'm in danger of needing an ambulance! I'll shut up about the music for a week or two, but do strongly recommend our new dancers invest in some SCD CDs... household chores, become an absolute breeze. If the musicians aren't "at hand", then I use the Music in Scotland website which I have found to be very reliable and prompt... unlike my dancing. Another useful link a member has provided me with, is one to a website listing SCD dances through out Scotland . If you are holidaying in Scotland, check it out. Week 12 Not surprisingly, both our teachers are great at finding good music for the dances. Last week it was Green Ginger's The Architect which had us flying through Thornycroft at FUNdamentals. Lots of great music this week too... Jig to the Music, Mr Michael Bear's Reel, Glasgow Flourish (Ah! Hana... ), Back to Bach (No, we didn't dance it to the Goldberg Variations or the devisor's recommended Bratach Bana, but the Plantation Reel), McDonald of Sleat (Wow... get those videos! ), Pink Triangle and finally the delightful Dancing Dolphins. Week 10 Monday evening and some challenging footwork in Lady Mary Menzie's Reel and The Bridge of Nairn for our advanced dancers in a new trial six o'clock hour... aided and abetted on this occasion by some very welcome visitors from Germany and the States. Seven o'clock and a full hall for The Flirtation Hornpipe, Montparnasse, W. James, A trip to Gretna Green, The Iceberg (A newly commissioned dance for one of our members who recently survived his half century... ) and Jim Johnstone's Reel. Several of the dances this week were taken from the programme for the upcoming Oldenberg weekend. Week 9 Eriskay Jig, Isle of Skye, Up in the Air, Machine Without Horses, Hairy Mary and Seton's Ceilidh Band... 'scuse me, while I remove that canary! Oh, and check out this play list... it's at 1:07:50. Next member's night... a video camera? Nice also to see our Pilling's course commented under "Further Reading" in the Scottish Country Dancing Dictionary. Week 8 Member's Night and out of the February gloom emerged Hooper's Jig, Reel of the Puffins, Blackwater Reel, It's all right, Machine without Horses, Mairi's Wedding and Morrison's Measure. Week 7 I am increasingly relying on the Strathspey Server's database to locate dances and while this is very labour saving, I am beginning to miss some of the odd stuff that just turned up when I "trawled" in YouTube! 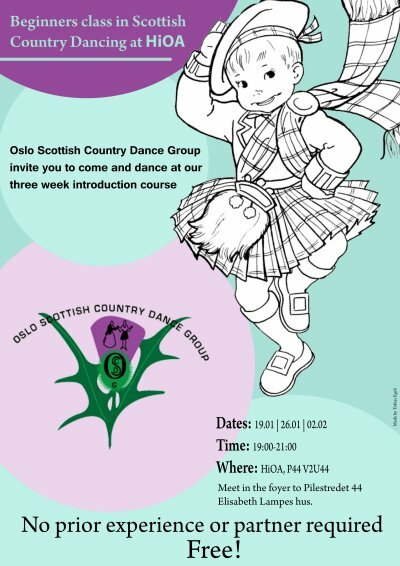 Here are this week's dances : The Fairy Ring, Beginner's Luck, Saw ye ma wee thing, Sally's Fancy, Get your skates on, Brisk Young Lad and The Bonnie Lass o' Bon Accord. Week 6 Fourteen folk here this week which made for some exciting dancing in seven couple sets... Machine without Horses, Morrison's Measure, The Certificate Dance, Swiss Lassie with that delightful Brumley Brae tune, Judge's Jig, The Tri-Mariner, Jean Martin of Aberdeen, Best Set in the Hall and Mr Graham Donald. Missing a few cribs and diagrams on the Strathspey Server this week so if anyone has these do send them to me and with the necessary permission, I'll link to them. As the Beginner's Course at HiOA ends this week, hopefully there will be some new faces joining us this coming Monday. Welcome to the OSCDG at Lilleaker! Extra Blog This is a morning-after-the-night-before very personal (and very visible! ), big thank-you from the blogger for this year's Burns' Supper: great music (James, Sarah-Jane, Anders ... in the break), great dancing (my particular heroes, Brian and Johan), great speeches (Christine and Caroline... get those "hurdies"), great haggis (courtesy of Crombie's and Norwegian) and not least, the great organisation by the committee, especially Anne and "The Chairman". There was lttle room for lamenting and politics in the middle of all that reekin 'n stompin, but ... as threatened... here are the words of Robert's Such a Parcel of Rogues in a Nation. (If you prefer to hear it sung you can choose between The Corries, Hamish Imlach, Steel Eye Span and Luke Kelly, but there are lots of others also on YouTube.) For us YES supporters these words are very poignant and could have been written yesterday. Slàinte indeed, Robert... little doubt which way you would have voted last autumn! Exceedingly interesting times in UK politics at the moment and yes, go for that Shakespeare Soirée you guys... I'll be there to toast him too! Us Scots do a great maudlin on the morning after, so what better than a bit of Väsen to bring me back to good humour and Scandinavian reality? Our very own Sarah-Jane will be on stage with them on 13th March. Probably too late for tickets? No, I'll be there! There IS life beyond the Burns' Supper and Andy Murray has just won through to the next round of the Australian Open too after putting us through the usual "Scots, wha hae wi Wallace bled...". Week 4 Lots of good social dances on the programme this week... is there any other kind, I ask myself? (That was rhetorical!) Canadian Barn Dance, Hooper's Jig, Fireworks Reel, Rougement Castle, The Fruitcake, 7th Wonder, Minister on the Loch and Swiss lassie. And if there's time... Morrison's Measure and Deil Amang the Tailors. Whew! Excelled myself in exclamation marks in this week's blog, without even pointing out all the stars along the way in the videos amongst all those really good dances and tunes. Woolly underwear, haggis dinner... bliss in January! Week 3 Yeah... FUNdamentals with 10 folk turning up and things afoot in Pilestredet! Dances this week: The Black Cat, Nottingham Lace, The Gentleman, The Bluebells of Scotland, Major Ian Stewart and Castle Brae.